The upcoming premiere of Star Wars: The Force Awakens blockbuster is just a couple of months away and the American watchmaker has already unveiled a number of Star Wars-themed timekeepers. There, if I understand correctly, will be sort of 'official' watches of the series. Besides the inevitable "Stormtrooper", and "Imperial Pilot" models, there is also a full-black Nixon 51-30 Darth Vader: a limited edition device that pays homage to the most iconic character of the series. And, yes: as you may have already noticed, all three models are dedicated to agents of the dark side of the Force. Ah, that irresistible attractiveness of Evil! Can you imagine a shoe polish company turning into a watchmaker that sells its "Built in Detroit" quartz-powered watches for $500-$1000? Well, Shinola, previously a maker of "America's Largest-Selling Shoe Polish", is just that company. After their brand was acquired by an investment group, the famous trade mark suddenly appeared not only on watches, but also on bikes, all sort of premium-priced leather goods and even soft drinks. With this Shinola Wright Brothers limited edition watch (ref. S0100052), the Detroit-based brand starts a whole series of timekeepers paying homage to famous Americans who gave humanity the wings to fly. Available at MSRP of $499 -and currently offered on their official web-site at just $400- this new Deep Blue Master Diver 1000 automatic diving watch doesn't look particularly flashy. On the contrary, the new watch is deliberately dull, almost as dull as a wrench or a hammer can be. With every brushed surface, with every massive part it declares: Look at me! I am a professional instrument! I am a beater that you can take every place you go! Well, it looks like it tells the truth. Assembled in the United States, powered by a high-grade Swiss made movement, and bearing a price tag close to $2000 USD, the new Mk. II Fulcrum automatic diver is a little bit too expensive to my taste, but it still looks great. Also, I really dig their decision to make the timekeeper ahem less similar to the original that the previous version paid homage to. Already having a pretty vast collection of divers on offer, the American watchmaking brand has recently expanded its product range with a new Deep Blue Depthmeter Professional chronograph that, as the name implies, also happens to be equipped with a functional depth gauge. 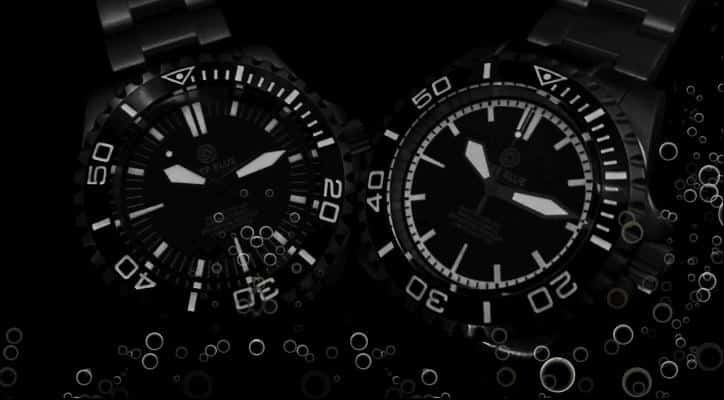 The new Deep Blue Daynight 32 T100 diving watch brings you all features that you may expect from the American brand: impressive water resistance that makes suitable for real diving, sturdy body that was probably inspired by a sledge hammer, a reliable self-winding movement made in another country, and the usual set of tritium tubes that glow brightly virtually for decades without needing any recharging. Here comes another good one from the young American watchmakers. Called Deep Blue Daynight Recon T100 White Automatic, the new semi-professional diver gives you an easily recognizable (although not terribly unique) design with elegant dial sporting the brand's signature luminous tritium tubes and a very impressive water resistance rating of 500 meters.